It was in 1997 that 30-year-old Michael Giacchino’s life came across one of its pivotal moments, one that would ultimately lead him along a path that has reached its latest highlight with a grand, career-spanning retrospective at the Royal Albert Hall in London. For it was then that the aspiring composer somehow managed to get himself an orchestra to work on the music for the Dreamworks Interactive video game adaptation of Steven Spielberg’s The Lost World – and that music led to him being hired by the same studio for the first Medal of Honour game – and that music came to the attention of J.J. Abrams, just pulling together a new tv show called Alias – and that was that. Around that same time, I have very fond memories of travelling to London every few months for great film music concerts – Jerry Goldsmith came every year, and there was John Williams, John Barry, Elmer Bernstein – it was one treat after another. Gradually, the well dried up and these days the trend seems to have turned more towards films-with-live-orchestra rather than film music concerts as such, in London anyway (there are various festivals around, particularly in Europe, which still feature “my” kind of film music concert). 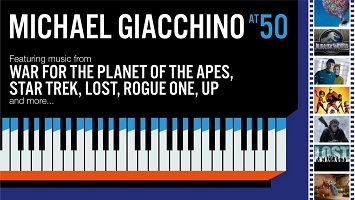 So it was great news when this Giacchino concert – the first major career retrospective for the composer – was announced. He’s built up a very impressive body of work and – billed as a 50th birthday celebration, with many of his directorial collaborators on hand – this always looked likely to be quite some event. As we waited for the concert to begin, pencil drawings the young Giacchino had produced when he was not yet ten years old were projected onto the screen – there was an ape on horseback, the USS Enterprise, Spider-Man remarkable really that the young man who dreamed of such things should grow up to be working on those very franchises. A few minutes later, it was quite clear this wasn’t going to be quite like anything I’d seen before as soon as the orchestra finished its warm-up and David Silverman – one of the original animators of The Simpsons, who has worked on numerous big projects since – ambled around the stage playing “Happy birthday” on his sousaphone (the audience eventually clocked on that they were supposed to sing along). Then out stepped conductor Ludwig Wicki and he led the Cinematic Sinfonia in the first piece of the night, a very long suite from The Incredibles – Giacchino’s first-ever film score (what a way to start!) and still one of his most popular. From backstage, out ran the evening’s host Adam Savage (best-known for tv’s Mythbusters, and Giacchino’s friend) – dressed as Mr Incredible. We went back to the score that really put the composer onto the musical map for many (including me), Medal of Honour, in a suite which included a couple of pieces from the first score and the theme from one of its many sequels, Airborne – stirring music indeed, and it took me back to that moment in 1999 when I heard it for the first time and realised what a major new talent was emerging. Next up was a piece from Jupiter Ascending, billed as “Arranged Marriage” but actually “It’s a Hallava Chase” from the album – an intricate piece from a score which is sure to outlast its film. Savage came back out, dressed as a dinosaur, and amusingly introduced Colin Trevorrow onto the stage by saying he’s the man “who directed both Michael’s highest- and lowest-grossing movies” – it was the former being played this evening, Jurassic World. Trevorrow spoke warmly of their collaboration, which was to become a recurring theme, and it was obvious that it was genuine warmth – he said that in their first meeting he told the composer to “go to dinosaur church” with the music and that’s what he did. His sweeping, expansive theme was a real highlight of the night. Benedict Wong, who played Wong in Doctor Strange, came onstage to introduce the “Marvel Suite”, which consisted of the composer’s studio logo music, a suite from Doctor Strange, the main theme from Spider-Man: Homecoming and then another arrangement of the studio music with a distinctly Goldsmithian flavour to round it off. Inevitably, the former movie was represented by more orchestral treatments of the theme, but it was a pity the terrific end title arrangement couldn’t be somehow worked in; a minor pity though because it’s a terrific theme, as is Spidey’s. Giacchino’s career has reached an extraordinary pinnacle recently, not just scoring those mega-grossing dinosaurs and comic book heroes but also going into Star Wars, becoming the first composer other than John Williams to score a live-action movie in the franchise with Rogue One, whose director Gareth Edwards provided an amusing introduction to the end titles suite from the score (“I’m not saying Michael’s obsessed with money, but I’ve had a few birthday parties and haven’t asked people to pay £50 to turn up to them.”) It’s a great suite of music, the beautiful themes sandwiching the grand Imperial music, and it’s testament to Michael Giacchino that he was able to write such excellent music do distinctively his but remaining firmly within the Williams-established universe, and do it all in such a short space of time. After the piece, a number of stormtroopers came onto the stage and abducted conductor Wicki, leading to his replacement – and the first appearance of the evening – by Giacchino himself. In the programme notes for the concert he describes Lost as being his favourite music that he’s written and the first half of the concert came to a close with a pivotal piece from the series. Showrunner Carlton Cuse said that at the end of the exhausting first season (“24 episodes – that’s like 70 years of Sherlock!”) he went to the scoring stage without having to worry about getting another episode ready the following week for the first time, and was there to hear the recording of the first season’s finale piece “Parting Words” – and it brought everyone on the stage to tears. Giacchino conducted it to picture – it’s one of his finest pieces for sure, full of emotion but cleverly structured, and amusingly finished off with that rasping stinger that greeted the ad breaks on the show. The second half opened with a special performance of “Married Life” from Up, which won the composer his first (and so far, only, but I’m sure that won’t be the case for long) Oscar. It’s an exquisitely-scored scene – Giacchino taking images that are already emotionally-devastating and pushing them even further – and was performed here by string quartet Bond. Adam Savage returned afterwards brandishing balloons – but no more silly costumes – along with Up‘s director Pete Docter and introduced the next piece, the short Pixar film One Man Band, which was performed live-to-picture. Like many of the Pixar shorts, it’s amazingly good and relies heavily on its music – but in truth none of them relies so heavily on its music as this one, where it is central to the story. Was great to see/hear. Andrew Stanton emerged to introduce a suite from John Carter by describing it as the best music that nobody’s ever heard, for a film that nobody’s ever seen – and read out his liner notes from the soundtrack album. And it really is very good music, the highlight being the soaring main theme. The terrific end title piece from Cloverfield, “Roar!” was next up (one of the standout moments for the choir) – it’s one of my favourite Giacchino pieces and of course works brilliantly performed live. That film’s director Matt Reeves then came out to introduce a suite from War for the Planet of the Apes, one of the composer’s most recent works and in my opinion his best. Edited highlights from the rousing end titles piece were appended by the score’s emotional heart “Paradise Found” and it brought the house down. One of Giacchino’s closest collaborations with a filmmaker has been with J.J. Abrams and he was given a rapturous reception when he came out onto the stage before a suite from the composer’s three Star Trek scores (the first two of which were, of course, directed by Abrams) and the composer returned with him to resume conducting duties, which he maintained for the rest of the evening. The main theme is surely the composer’s best-known (a little like Jurassic World, I’m sure it would have permeated much more into popular culture if not associated with such a long-running series which already had such iconic music associated with it) and the Yorktown theme from the third movie is another real highlight. After that, Abrams was back out and the pair were talking when one of the evening’s more surreal moments occurred, Gonzo (of The Muppets) appearing with his creator Dave Goelz, who is the composer’s friend. A rather lengthy and very strange sequence of events unfolded, including J.J. Abrams and Pete Docter trying to entice a cow onto the stage, and culminated with Gonzo and Giacchino (well, mostly Gonzo) singing “I’m Going to Go Back There Someday” from The Muppet Movie. I won’t attempt to explain further – you had to be there. 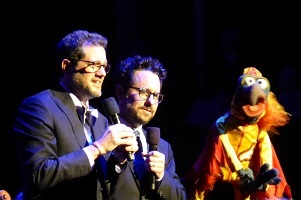 The somewhat tenuous Giacchino connection is that he did do a few Muppets projects earlier in his career. The main body of the programme ended with the brilliant end title piece from Super 8, one of the composer’s most personal-sounding film scores and still one of his best. This accompanied a series of actual Super 8 films he had shot as a boy – unfortunately it took three attempts to get going because of sound problems with the click-track, but it was worth the wait. After a standing ovation, of course Giacchino came back for an encore, which (to my surprise) was “Reboot” from Speed Racer. It’s energetic and very entertaining piece and turned out to be a fine choice. All the composer’s collaborators from the evening returned to the stage with him one last time – before composer was left alone again and, to everyone’s great joy, announced that the second encore would be music from the forthcoming Pixar film Coco. He played a couple of pieces, the first of which was a great Mexican-flavoured, warm and joyful piece which makes me anticipate the film and score a great deal. There was time for one more surprise, as the composer finished the evening with “Bristow and Bristow” from the first season of Alias. There was a wonderfully diverse mix of people in the hall – great to see some youngsters taken along by their parents, thrilled with excitement at the Marvel scores and Star Wars – and I spotted a couple of film composers, Daniel Pemberton and David Arnold. It was a really good, fun event – very long (well over three hours) and handsomely put together, the evening produced by the composer’s sister Maria. The only really significant absentee from the programme was Inside Out, but I guess there just wasn’t time for everything (I’d have loved to have heard Secret Weapons Over Normandy, but that never seemed likely). Over the last couple of decades I’ve moved from describing Michael Giacchino as one of the most promising composers around, to seeing him reach the very pinnacle of film music, where he currently resides (just look at the projects he’s done in the last couple of years, there’s no doubt he’s at the very top of the tree at the moment). And what’s striking is that everybody who works with him seems to absolutely relish the experience. Getting all those collaborators up on stage with him for this evening was testament to that – but more powerful still is the fact that barely anybody who has directed a film featuring his music has ever gone on to work with any other composer afterwards. While the birthday celebration theme made it a unique occasion, I’d love to see Giacchino return for more concerts in future – there were thousands in the auditorium (one of the greatest concert settings in the world) who I’m sure share a similar feeling. 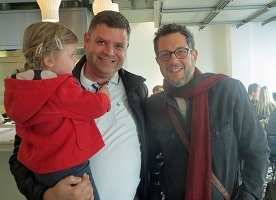 I did have one final surprise, the next day – eating lunch with my family and who comes into the restaurant but Michael Giacchino. He graciously posed for a photo and I got to tell him how much fun I’d had – and even in those few moments I could tell that he is proof that sometimes, the nice guys really do rise all the way to the top. And he deserves his place at the top – he’s one of the best film composers around and should have absolutely loads of great film scores still to come. Thanks for this review, it surely seems like a wonderful evening. I‘m amazed by the number of high-profile guests. I wish I could have been there, but I will definitely join the live audience when MG will finally receive his Max Steiner award in Vienna (I‘m from Austria). Giacchino is my favourite active composer and probably the only one of his generation who has truly found the key formula to write fun, thrilling and most of all emotional scores that rely on melodies and themes above all. Excellent write-up! Wish it was in the US 🙂 I hope this was recorded, although I bet there is zero chance of this ever getting released due to all the different studios. Nice to see he played some of his less well known stuff, like Speed Racer. Wow what a treat. Sounds like it was a great time. He really does seem like a genuinely nice guy who loves his job and that others love collaborating with. Glad you had a great time.